Hey hey! Back from the beach and ready to talk $$$$! But first up – special shout out to my son, J. Penny, who turns 5 today – whaaaaaat?! How did that happen? Remember when I wanted to track all his expenses for 18 years but then gave up a little after two when his baby brother, J. Nickel, came around? Hah! Some biggies in there like daycare and medical and even college savings (all of which will vary drastically between families, of course), but still mind blowing when you see it all added up like that. And that’s just for our first kid! I love you buddy!! Keep expanding that brain of yours and one day you’ll be taking over the family biz! All automated from the beginning too so we never got used to seeing the money – tip #381! ROTH IRAs (+$973.77): A nice little increase here too without any additional contributions lately (we usually max it out all at once at the beginning of the year once we know our tax situation from my biz). As always, you can see all 100+ previous net worth updates of ours here, and of course check out the over at Rockstar Finance where there’s now 359 bloggers publicly disclosing their net worths. We’re not shy anymore, that’s for sure! Nice job on the increase… keep it climbin’! Ack – what a birthday present! Happy Birthday to J.Penny! Five and on he’s going to be getting into all kinds of activities now. Enjoy it, it goes fast. I know everyone says that but we are two of our three are heading to college in the fall and my wife and I still look at each other and ask how did this happen? Congrats on a solid month! Just dropped him off at camp and can’t believe how much of a little man he is now! I’m sure you remember clearly all yours’ first steps too :) I believe it goes by fast! I’m curious about your TSP allocation! Care to share? Yup, she’s 100% in the . Not as aggressive as I’d do myself if it were my account (I like the and stock indexes! ), but hey – it’s her money ;) And really, all the TSP funds are pretty amazing w/ its low fees. You forgot to add $1,000,000 – $2,000,000 to your net worth due to your M&A deal with your online business! Happy birthday J. Penny. Congrats on a solid June and getting closer to your goals. Little by slowly. The TSP is a good retirement plan. My dad was a GS employee for 37 years and contributed to a TSP. Great stuff. You know what they say, the first $100,000 is the hardest! Awesome work! Keep it going. Love these updates! Happy birthday, J Penny! And congratulations on an impressive month of net worth, J. Money! It’s always great to check your net worth report every month and see the number increase. Sir, you’ve got a good, really good month. Oh $hit, yeah it is. Nicely played over there! Woo! I like how you just slipped that in there at the end too as if it wasn’t no thang ;) That’s huge girl, congrats!! The tiny home village idea isn’t a bad one. I have seen (er watched YouTube videos) of people who build these with a main house for kitchen/bathrooms and just rent ’em out nightly/weekly. Definitely not passive by any means, but depending on the location/market, might be preferable to staying at a hotel. Very cool – clicking over now! You’re doing really great J$! “cash savings + debt > less savings + no debt” – totally agree! Your son is an artist! Our kid’s art work is usually just a blob of color or two. He has no patient for art and just want to go play. Yeah, childcare is ridiculous. I’m so glad our kid is school age now. Pretty soon both of your boys will be in school. That will be awesome. We’re getting closer every year, but now considering adding a 3rd to the mix which will jack it all up, haha… Somebody stop me!!! Happy Birthday to Penny. Loved the drawing. I think it looks like a turtle ownership flowchart. June was a good month for me. Mostly because it’s a 3 paycheck month and I don’t include the those in my budget so it can all go to savings. Congrats J$, that more flat increase this year is only relative, if you look at the actual number it’s quite impressive! Baby Penny and Baby Nickel are two lucky little coins and most likely won’t have student loan problems. Great net worth increase J$! Pretty soon you’ll be pushing millionaire status! Love your monthly net worth updates! Congrats on adding up another $5k, that’s awesome. Your doing it right J money! Love the picture on the 4th. The impressiveness of your month of financials paled beside the impressiveness of your 5 year old’s art. That is _clearly_ Evel Knievel doing stunts on a turtle’s back (and for good measure said turtle is wearing Spongebob’s shorts – I guess Spongebob must be running around somewhere with it all hanging out, assuming that sponges do in fact have stuff to hang out). Haha… My son is going to LOVE that answer!! And it’s much more creative than what it actually was too – which was “a bird.” Hah. Hey J! I’m excited because my PC reported a new milestone for me, 90k(!!!! ), and all of a sudden it’s up to 94k! that jump is mostly from the zestimate increasing on my home, so it feels inflated, but I’m gonna pop bottles when I break 100,000! Thanks for encouraging me to track, love doing it with personal capital. Nice, Nice – I did make an extra pay down on the car loan – to keep savings but to just get rid of this thing quicker, less than 60 days and I’ll be auto loan free. Also – I bet you enjoyed the nice little dividend you received for the Vanguard fund you have – have to love it – reinvestment I am assuming? Keep the push hard, you’re killing it and having a great time it seems along the way. Happy birthday to J Penny! All of this investing stuff is relatively new to me, so reading your reports has been super inspiring and educational. My husband and I have always invested in our 401(K)s as much as the company matches, but are getting ready to invest more in a Roth IRA. And figuring out our net worth is on our to-do list. I do have a question I would love to pick your brain about….We are currently saving a six month emergency fund. 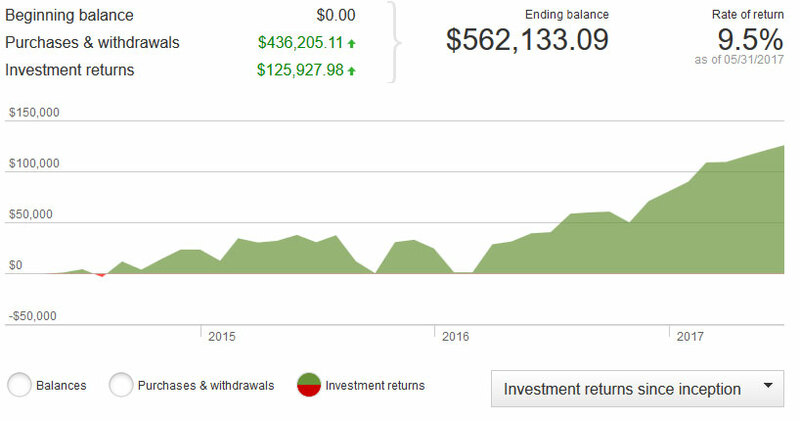 Would you recommend only keeping a three month fund in cash and investing the rest? If so, what would be some options that could keep our savings fairly liquid while also earning some interest? This would be in addition to our retirement savings. Thanks so much! Fun! Will you be sharing your net worth publicly or just keeping it amongst yourselves? As for emergency funds – never a “right” answer there as we’re all comfortable and aiming for different things. I will say that you can never go wrong keeping buckets of cash in it though, so whether you need 3 months or 6 months or even 6 years worth (okay, well that may be too much haha…) you gotta do what makes you most comfortable :) not every dollar needs to be maxed out for returns. I just had to chime in and once again sing the praises of the Baby Tracker idea. That was just so funny to me, and yet at the same time it held out the promise of the offering the most informative blog post of all time if you could have kept it going for 18 years! Thanks for the net worth updates. You inspired me years ago to do this, and I am so thankful that I did. Happy birthday to J Penny! Health insurance used to be a beautiful thing. My first child was born 9 weeks early and our total out of pocket was a little over $1100 (including medicine co pays). He was in the NICU for 8 weeks, I added up the total once, it was roughly $115,000 billed to insurance. Cant even imagine with today’s insurance, I’m sure I would have easily hit the Max out of pocket and been on the hook for like $12,000 + whatever technicality they could find to disallow other charges. That would have ruined us at that time in our lives. Oh yeah – I don’t miss our crappy $1,000/mo premiums we were paying at all. It’s been great since the wife started working with the feds! Especially if we do venture out to kid #3 (gulp). I think I’ve said it before. The only thing I ever hear older people say they regret is not having more kids. I have 4 boys and will not be saying that, I can honestly say I’m good now. I just didn’t want there to be a twinge of regret. If it helps at all, with our 3rd child we barely skipped a beat. Was like 0% extra work, but every child is different, with our 4th, he made up for how easy our third was and then added on top of that. Our boys have the same birthday, one year apart! Nice job on the Net Worth boost- I need to update mine sometime soon. 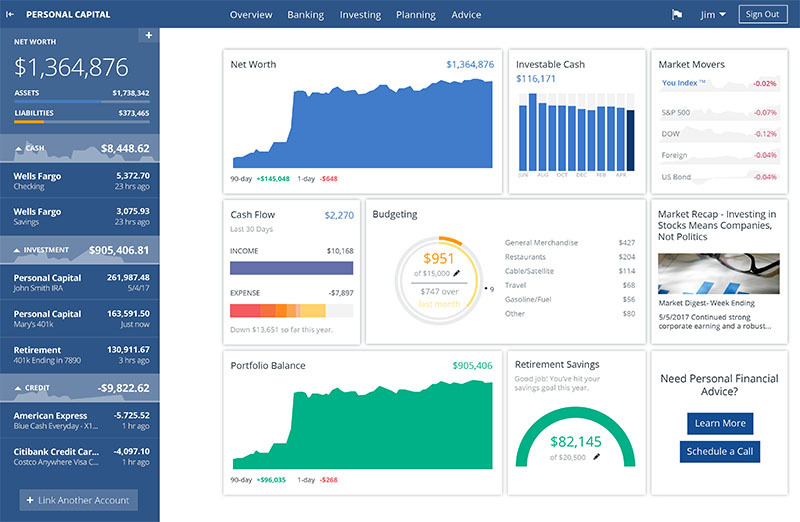 I love budgets….I use YNAB, you need a budget, and it changed my life. Thanks for sharing yours. And holy crap, kids are expensive! Your posts involving your sons are beyond, beyond cute and heart warming. I would be keen on just a “day in the life of a dad x2” post! We only started tracking our NW this month and the first time we did it, I did it wrong, ha! >_< can't wait until we get to your level of experience. We’re at about $640,000 this month. I had a slow month of sales in June. Still on your tail. Keep up the good work. While having the data for his first 18 years of life would have been interesting, I’m glad you stopped trying to collect that. More time to focus on enjoying them. I hope your family had a lovely birthday gathering. My month did well and I’m looking forward to seeing where I end for July. Congrats on the solid net worth gain. 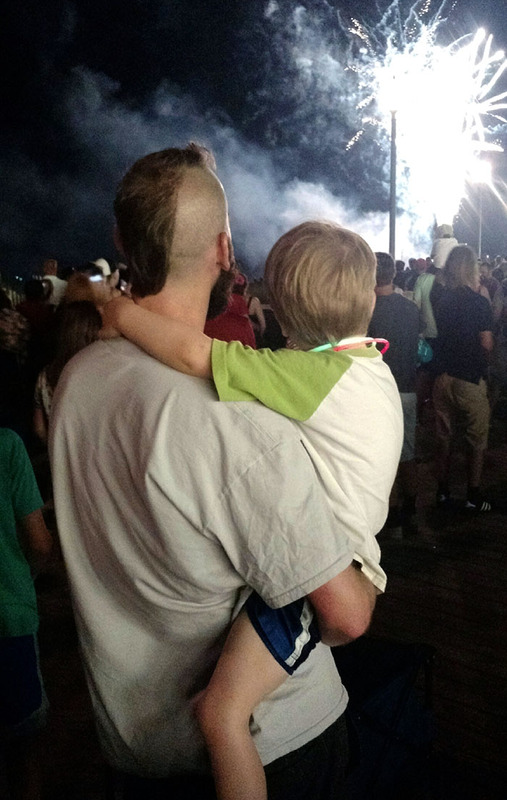 Loved the update, but especially loved the 4th of July pic with you and your son. That’s what it is all about! Hope he had an awesome birthday. My family just crossed the 100k mark in net worth in cash and investments (not including assets). Since following your blog and a couple others that we discovered a couple months ago, we have increased our savings rate dramatically. We are now putting $2,250 per month in my husband’s 457, $320 per month in his 403b, and $1,600 per month in my 401k. We are trying to catch up for this year so we can max the 457 and 401k. Thanks for all your inspiration! Daaaaaaamnn… Y’all will be surpassing us in no time w/ that kind of savings rate! Keep going!! Love the net worth of your two babies, baby nickel, and baby penny. I’ve done the same thing to my kids and got them started early. The times when they do not know much about money is the best time. I remember my wife opening up a joint bank account with our two kids and start initially with money gifts from relatives. They really add up big time. They’re both done with college now and they’ve taken over their accounts and it’s great to see how they start growing their net worth now themselves. Good job! Oh wowwww – that time just FLEW by too, didn’t it?